It was so tasty that I wanted to marry it! Pasta! I think I may have stayed on a low carb diet for too long! Pasta brings such a big smile to my face! There are so many flavors and things you can do with it. I have had pasta for dinner at least 3 times for the the last two weeks. Last week I was obsessed with trying to find out a way to make vermouth reductions that I really enjoyed. It all started with a simply enough. The shallots were finely chopped, and added to the pan with some olive oil. I then put in some garlic, and then let that fry up a bit. How do you go wrong with pancetta? I don’t believe it possible. I threw in the pancetta and let that fry up for a long while on a medium low heat. Once that was just cooked to satisfaction, in went the raw green beans. I added about a 1/2 cup of vermouth and let that reduce and put my bow-tie noodle in the boiling pot of water. I love bow-tie pasta! They are so cute and sauce shines off of them perfectly. When the liquid had reduced to satisfaction, I used a slatted spoon to remove the noodles from the pot. It helps the sauce to do this. After adding a little red chili for some much loved sweet heat, I then toss everything together in the wonderful “flips-the-pancake” move I learned over the years never to do with a pan that doesn’t have a rounded bottom edge. Hahaha! Big Mistake! I plated the pasta in one of my nice white bowls and topped it off with a little cracked pepper and a healthy amount of Peccorino cheese! NUMMMMm!!!! Two days later I was right back at it! I pretty much made the same vermouth reduction, but I changed up the ingredients a bit. 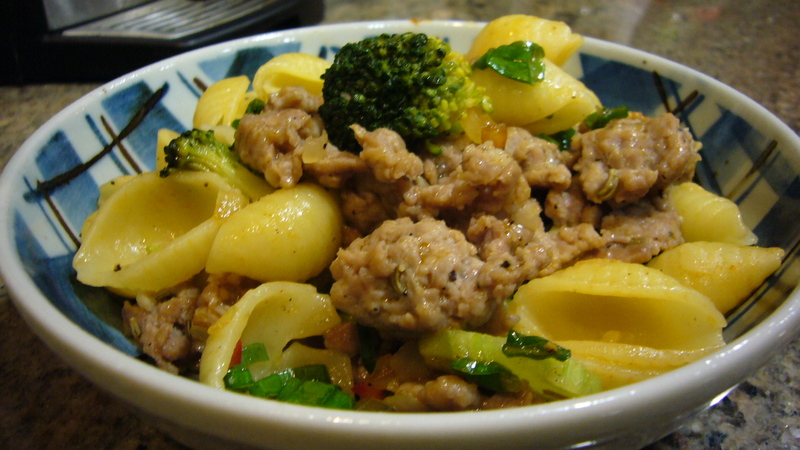 This time I used a nice Italian sausage with fennel, broccoli, and medium shells. I cut sliced portions of the broccoli stems and cooked them up with everything. I had a salad on the side and that was dinner! Both the pasta took me a bout 30 min to make from start to finish and they were so much more tasty than if I had gone out and ate at some of the restaurants that we have in town. I didn’t use a flash with either of the cameras. ← Come Dine with Me! I LOVE your recipes Terri!! AND…the caloric value is very low…who said anything you eat that’s fabulous is fattening? ?